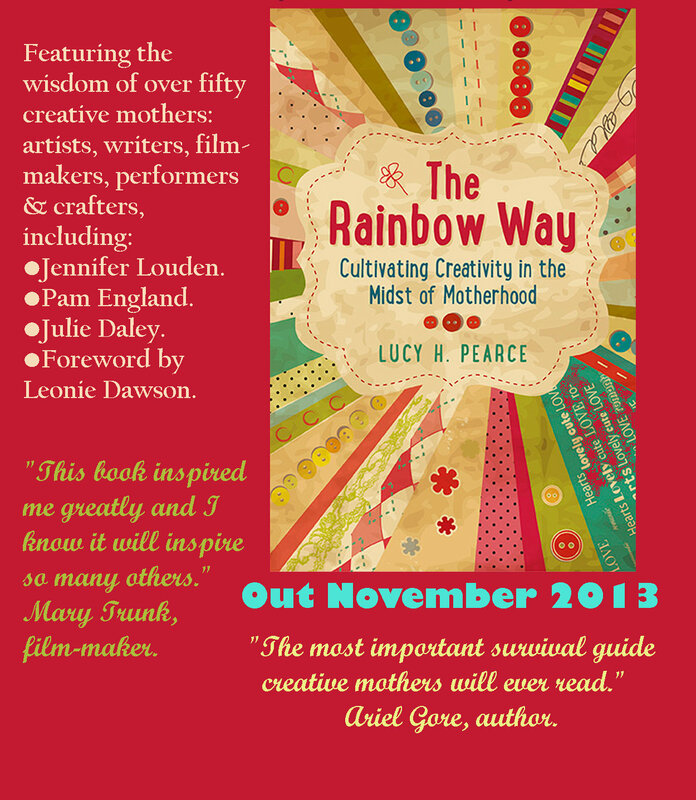 Welcome to the final week of the month-long Carnival of Creative Mothers to celebrate the launch of The Rainbow Way: Cultivating Creativity in the Midst of Motherhood by Lucy H. Pearce which has been Amazon.co.uk’s Hottest New Release in Motherhood for the past week! Today’s topic is The Creative Process. Do read to the end of this post for a full list of carnival participants. The dictionary defines the word “process” as: “a systematic series of actions directed to some end” which I find very interesting as for me the creative process has no end. Being creative for me is a process the runs from start to new beginnings and one of the most important parts of this is to recognise that there is no finality or end. In fact, I feel very strongly that being creative be-gets more creativity. Being creative is fundamental to who I am. My inspiration for food comes from going and looking for fresh ingredients to cook with, be it in the shop or in a raised bed. Once I decide a core ingredient I’ll often visualise how it would look on the plate, I’ll dream about the flavour I want to recreate when I’m cooking and I’ll experiment with the flavour balance. Once that dish makes it to my tiny kitchen table (where I shoot all of my photographs) I’ll have my camera in hand and I’ll try to capture the essence of the dish for my readers. Being creative doesn’t end there though, as I still have to write up the recipe and often an introductory piece for the blog. Then it’s back to the drawing board; I’ll often try to improve on a recipe, swap out ingredients to try a different flavour profile, or even try to re-plate and shoot the images again if I’m not happy. Having a creative space in which to express myself gives me head-space that is so important when I am smack bang in the middle of motherhood. By showing the children how I progress on my creative journey, I’m inspiring them to have courage to walk their own creative path. When I was at my least creative, I was at my most successful career-wise and yet (I know now) incredibly unhappy. Now I spend my days indulging my creativity and my heart sings. Lucy continues to inspire and encourage many mothers in similar roles. She is rightfully incredibly proud of this book and I am honoured to count her as my friend. Caitriona at Wholesome Ireland – from start to new beginnings. In “As an Artist”, Lucy Pierce at Soulskin Musings offers a poem about how the creative process beckons her through many of the archetypes of womanhood. Jackie Stewart at Flowerspirit.co.uk talks about how creativity is opening up a space for the unknown to reveal itself to you in ‘Creativity Flourishes in the Sacred Unknown’. Licia Berry, Illumined Arts “Creativity and Healing are Ideal Partners”. The creation of visual, musical, or expressive arts is the quickest, most effective and painless way to heal. Kirstin at Listening to the Squeak – My creative process and how to break creative blocks. our time and permission to honour the creative process within all of us. Aimée at Creativeflutters goes into her creative process and looks at what makes things tick or flop in “Spontaneous She – How to Keep Your Muse at Work”. Dawn at The Barefoot Home believes the creative process can’t be taught it has to come organically and at its own pace. Here’s to singing hearts! Thank you for joining the carnival! The head space is vital. I couldn’t agree more about the importance of children seeing their parents following their creative paths. Loved this.